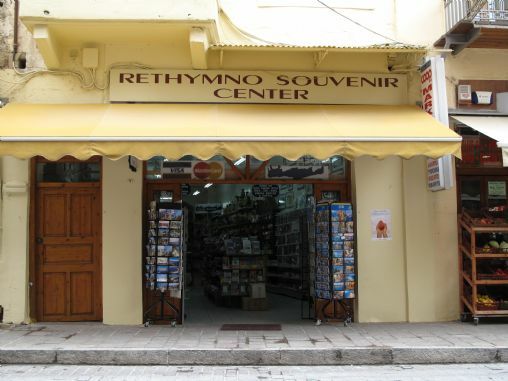 Rethymnon Souvenir Center, a friendly family run business which is the longest running souvenir shop in Rethymno, now trading for over 20 years. John and Vivi have thousands of souvenir items to remind you of your Crete holiday from collectable Cretan thimbles, local books, guides and maps of Crete, ceramics of all kinds based on ancient traditional designs, metal statues and figures of Gods and Goddesses from Greek mythology, T-shirts, playing cards, calendars, Greek Orthodox icons, Greek stamps for collectors, collections of Greek coins and hundreds of other gift items from Crete and Greece. They also sell a wide range of postcards, car stickers and posters. All gift items are carefully wrapped and bubble wrapped for you to transport them home. Over 20 years, John and Vivi have made thousands of friends who return again and again. The wall shows hundreds of postcards sent from happy customers all over the world. An online shop linked from this page where you can purchase a selection of mailable souvenir and collectable items from wherever you are in the world and have them delivered directly to your door. 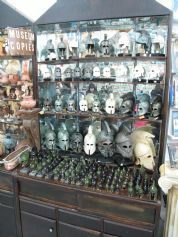 For all your holiday souvenirs, don't forget to vist Rethymnon Souvenir Center for that perfect gift.